For years, most pundits believed that interest rates had nowhere to go but up; now, with rates near all-time lows, it seems everyone has shifted to the bullish camp. Another day, another 52-week low in the 30-year U.S. Treasury Bond Yield (TYX). As we mentioned at the beginning of June, the break below the post-2015 Up trendline in the TYX suggested lower yields to come, so we are not surprised by this move. However, the depths to which the TYX has fallen should not be glossed over. To say that yields are at a 52-week low severely downplays how low they are. At 2.43%, as of today’s close, the TYX has only been lower during 2 months (January and February of last year) – ever. As we recounted in our post from earlier in the month, it’s going on perhaps a dozen years now that we’ve been hearing a similar and nearly unanimous refrain when it comes to the bond market: interest rates have nowhere to go but up. Yet, here we are a dozen years later with the 30-year yield near all-time lows. And judging solely by the technical price action, the TYX looks as if it is likely to continue to go lower still. As recently as early this year, it seemed as though the consensus opinion was that interest rates were poised to begin that long-awaited trek higher. Once again, of course, that view ended up being misguided. For some reason though, during this first half of the year downdraft in rates, something seems different to us. Perhaps it is our instinct fed by many decades of experience. Or perhaps we are succumbing to the same persuasions that have caused others to expect interest rates to rise for many years now. However, as we mentioned in that early June post, “…there are some ancillary factors that have recently begun to lessen our conviction of indefinitely lower rates…”. Some of these factors are anecdotal. For instance, while “zero interest rate policy” (ZIRP) globally seemed unsustainable for many years, it appears as though the masses have become quite comfortable with it. Indeed, with the move to “negative interest rate policy” (NIRP) across a not-insignificant swath of the globe, the idea of lower (rates) for longer has become the accepted, and expected, path. It is not just subjective factors that feel different, though. There is quantitative evidence to back it up as well. One such piece of evidence comes from today’s Chart Of The Day pertaining to 30-Year T-Bond Futures. It shows that according to CFTC Commitment Of Traders data, Commercial Hedgers (i.e., those on the other side of commodity funds, hedge funds, etc.) are now holding a net short position of more than 100,000 contracts. This is the first time that milestone has been hit, and their largest net short position, since 1998. As we have mentioned many times before, Commercial Hedgers have been given the moniker of “smart money”. This typically brings about plenty of questions and confusion when we discuss this topic. It is not that these Hedgers are always right, or smart. They do what their name implies, i.e., hedge. They are, again, taking the other side of positions held by Non-Commercial Speculator firms, e.g., commodity funds, hedge funds,etc. These Speculators are typically trend-followers so they will generally add to longs as prices rise and add to shorts as prices fall. Therefore, the Hedgers will build up positions counter to the prevailing trend. Thus, during a long trend, Hedger positioning can be on the wrong side for a long time, and to a great extent. However, the reason for their “smart money” reputation is that at critical turning points or junctures in an underlying contract, they will most often be positioned correctly for the turn. And the more significant the juncture, often times, the more extreme their (correct) positioning will be. 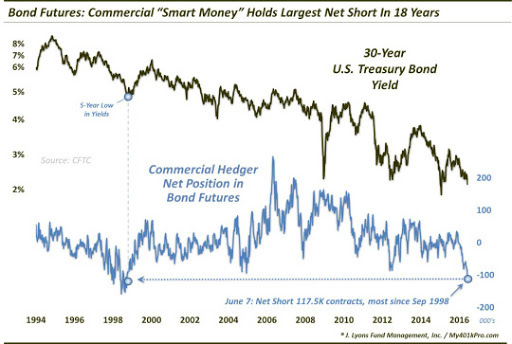 In this case, these, so-called “smart money”, Commercial Hedgers have their largest net short position in bond futures in 18 years (meaning Speculators are at their most bullish). Incidentally, the last time Hedgers were net short more than 100,000 contracts was in September 1998, just as bond yields were breaking below a 5-year floor to plumb 30-year lows. Within days, the TYX would form a low around 4.10% that would hold for the next 4 years. Of course, as we always caution when discussing COT data, using it as a timing tool is tricky. What marks an extreme in one cycle may not be the case in the next. I.e., while Hedgers’ current net short position of 117,505 contracts mark an 18-year high, there is nothing to say the position cannot get more extreme. Indeed, in the past few years, we’ve seen COT data go to unprecedented extremes in contracts like crude oil, the U.S. Dollar and others. Furthermore, while the extreme may indeed wind up nearly marking the cycle low in rates, it doesn’t mean that a substantial rise in rates is imminent. As we’ve pointed out, after Hedgers set an all-time record short position in the Dollar last spring the currency did indeed top out. However, it has generally moved sideways over the last year while the extreme COT positioning has been unwound. Therefore, as always, it still pays to track prices first and foremost, with ancillary factors serving as supplementary analysis. And prices continue to trend higher – and rates lower. Therefore, we have little reason, so far, to fight that trend. However, for the first time in a long time, it feels as though the sentiment pendulum has begun to shift. No longer, it seems, does the investment community view rising rates as an inevitable and imminent path. And perhaps it will be just that widespread shift in expectations to the bullish side of the bond boat that will allow for the long-awaited bottom in interest rates…eventually.